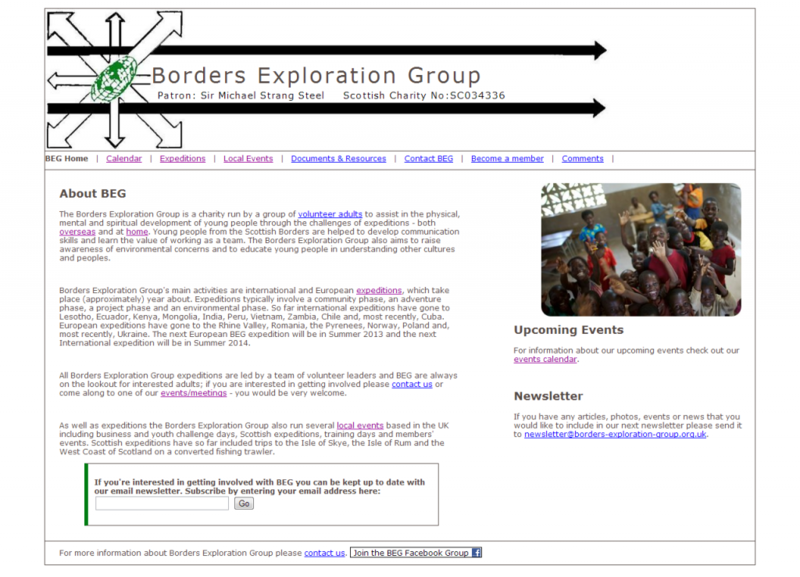 A few years ago I joined the committee for Borders Exploration Group and took on the role of webmaster. The old site did a good job but wasn't ideally laid out - a lot of old information was left hanging around on the site and lots of current information was hard to find. The "new" site isn't an example of my best work now but it is a good example of my best work from five years ago. The site would have benefited from a CMS (and would still - a project for the near future!) but the vast amount of old information and the difficult structure of the site meant everything needed to be rewritten from scratch and a CMS like Wordpress wasn't able to be used on the hosting of the time so the whole site was hand coded. The site benefits from the excellent imagery that various expeditions have taken over the years and hopefully the simple layout reflects this.